My name is SSgt Luke Jones and I am currently deployed. I have a lifelong dream to take my wife and my parents to see a Vikings game in Minnesota. 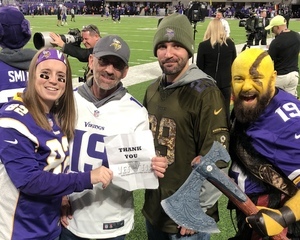 We are HUGE Vikings fans and it would be a dream come true. Since I was a child I’ve always wanted to beat the drum or blow the horn before the game. 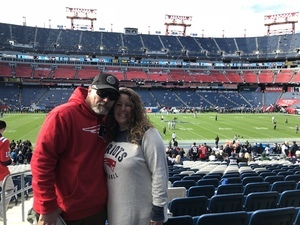 November 24 is my wife’s birthday and I would love to take her to the November 26 Sunday Night game vs the Green Bay Packers. March of last year my brother passed away unexpectedly and at the one year mark I was deploying. It has been a rough year on my whole family and my biggest wish would be to bring smiles to my parents faces. Just wanted to say thank you to everyone who donated. It was an amazing experience coming home being able to attend this game with family members and enjoy the Vikings win. 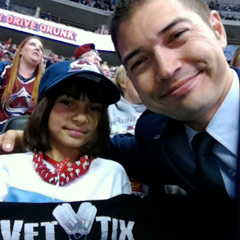 Thanks again Vet Tix and everyone who donated. 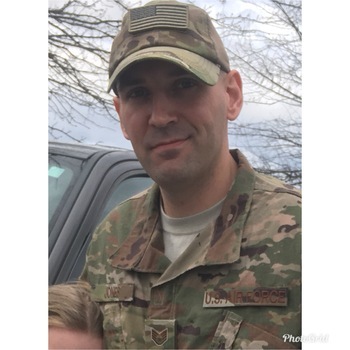 I am CW3 Dennis White, a member of the Indiana National Guard with the 38th Sustainment Brigade, currently serving in Kuwait in support of several operations. I have been blessed to serve my State and this great Nation for over 23 years. I am married to Angela and have three boys Shad, Jaden and Brenner as well as a sweet girl, Brayleigh. All of my kids and especially my wife, have made countless sacrifices in order for me to serve. I have missed countless anniversaries (2 back to back these past years), birthdays, and a majority of my son's Senior year in High School. I also coach sports for my hometown school, Paul Hadley Middle School, as a lay coach and have missed this years sports teams and the ability to coach and mentor young student athletes. I really want to represent them and my family well while serving and want to take my family to Disney as a thank you for their enduring sacrifices they make so that I can do the job I love. I would love to take the family to Disney World after my deployment. The past year even for the train up has been non-stop with over 8 weeks on and off of training and now this deployment. Would love to be able to spend time with my family of 6 at Disney World. 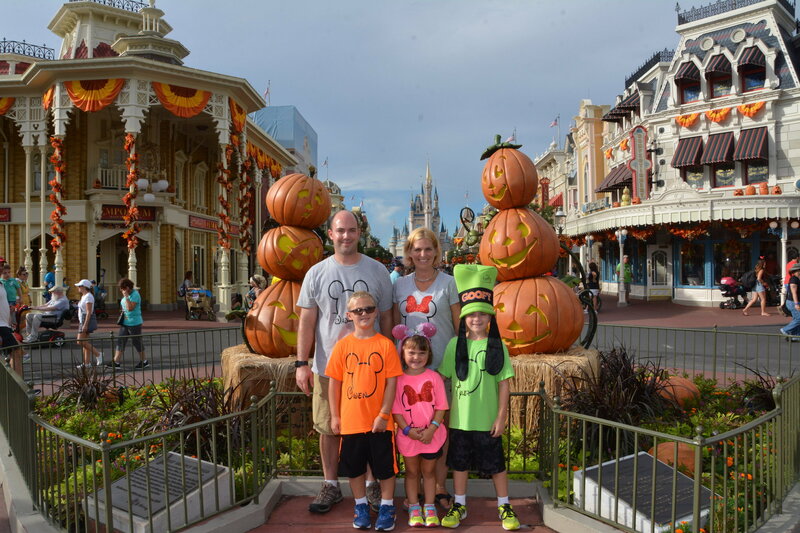 We have had to table trips because of many other time demanding events and need some away time as a family. It would be a true privilege to receive this Wish of 6, 5 day Armed Forces Salute tickets in order to treat my family to a well deserved get away. Thank you for your consideration and thank you for supporting this who serve. My name is SGT Bruce Messer. I am born and raised in Ohio and have always been a Buckeyes fan. I've never in my life been to a game in person. I've always dreamed of going to a game and of course the ultimate game would be against our biggest rival. I have friends I would love to take. 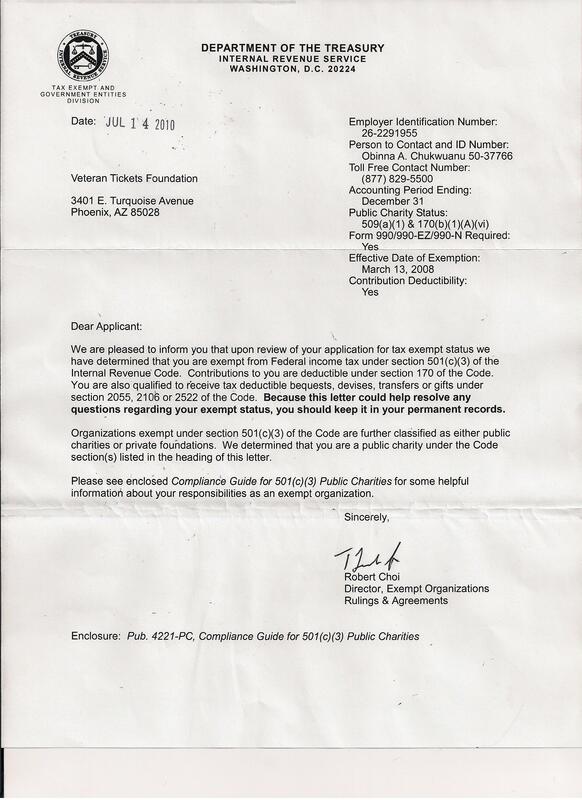 I'm a disabled veteran of combat and can't work. I am married with 6 children. 4 of which are still in school and two that have graduated, one that is engaged to be married. I live off of disability and SSI, and my wife works full time to make sure we have extra cash after bills. We focus all of our funds to bills and our kids so buying tickets is out of the question for me. My Name is Capt. Kevin Ashley. I am in the Alabama Army National Guard of the 208th CBRN Company. I am married (Krista Ashley) with two children (Anna Klaire Ashley -12, Carson Ashley - 10). Both my children are huge Harry Potter fans. 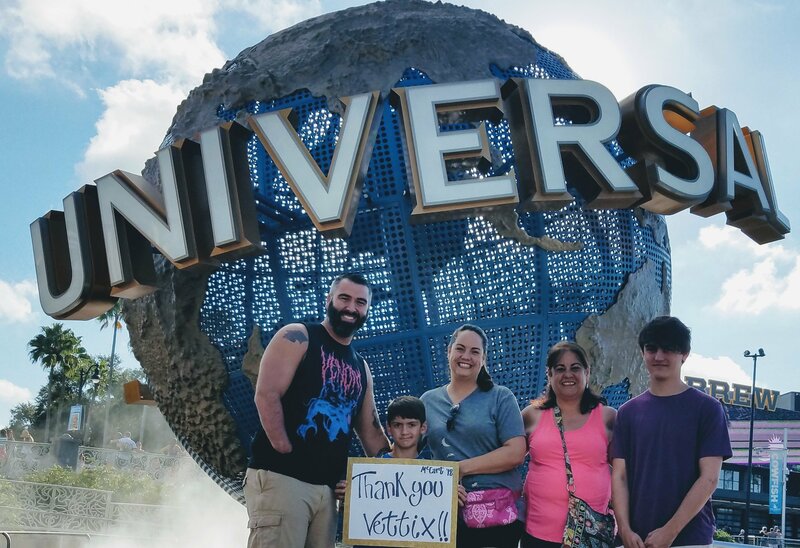 I would like the opportunity to share in their love for Harry Potter by taking them to Universal Studios Orlando for three days during their fall break in October of 2018. My name is SSG Joseph Weghorst. I'm in the Army with 12 years of service, I'm on my 4th deployment, 3 to Iraq and 1 to Afghanistan. This deployment I am in Iraq and have been away for 5 months, prior to this I did one 15 month tour to Iraq, and 12 to Iraq and Afghanistan. 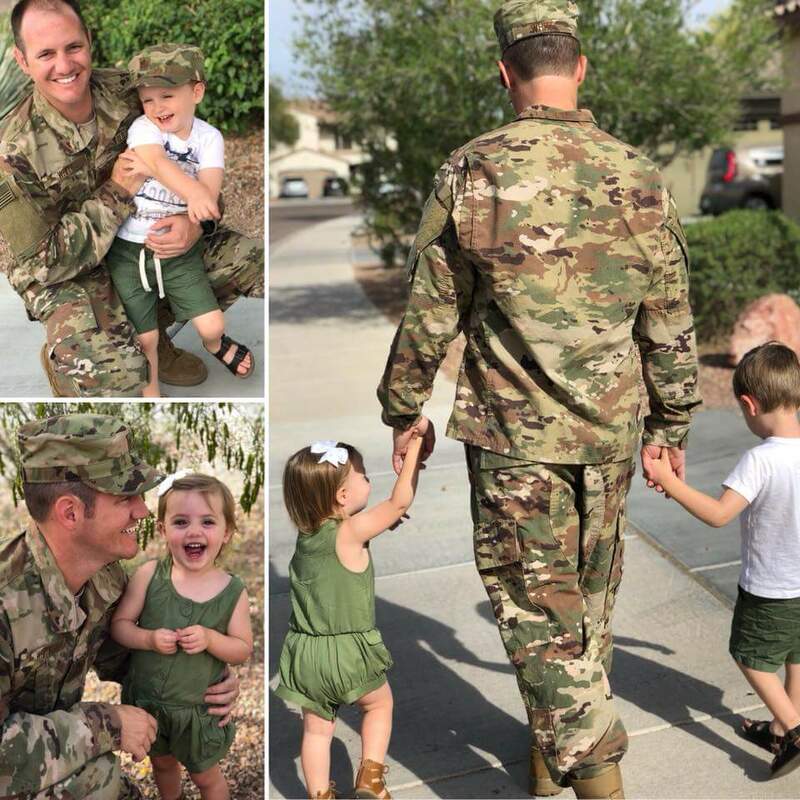 I joined the Army when my kids were 5 and 3 and have spent all four of my deployments away from them. This year is my daughters senior year of High School and I have missed it, but should be home just in time for her graduation and would like to take her to Disney after graduation and before college. For block leave prior to this deployment I was suppose to take her to Disney, but my mother tested positive for breast cancer so we cancelled our Disney trip and visited my mother. Me and my family can not thank everyone enough for the opportunity that was provided to us. 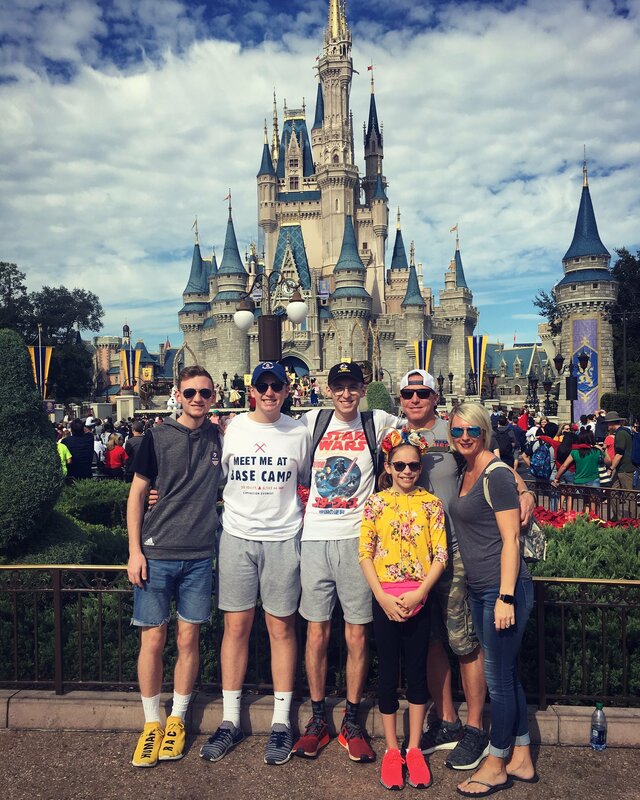 It meant so much for all of us to spend this time together at Disney World. My daughter has wanted to go to Disney for years and for me to be able to return from Iraq and take her there on her first break from school will be a lifetime memory for our whole family. I really can't thank you enough. 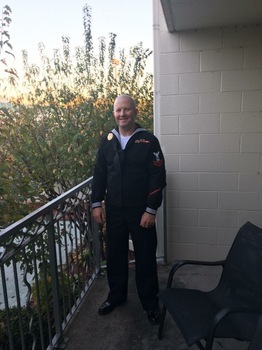 I am Chief Petty Officer Christopher Fisk and have been in the Navy for 12 years. I have a beautiful family of 6. My wife Hannah and my children Heaven, Italia, Derek, and Maddox. I recently just got back from my deployment to Iraq and Kuwait. 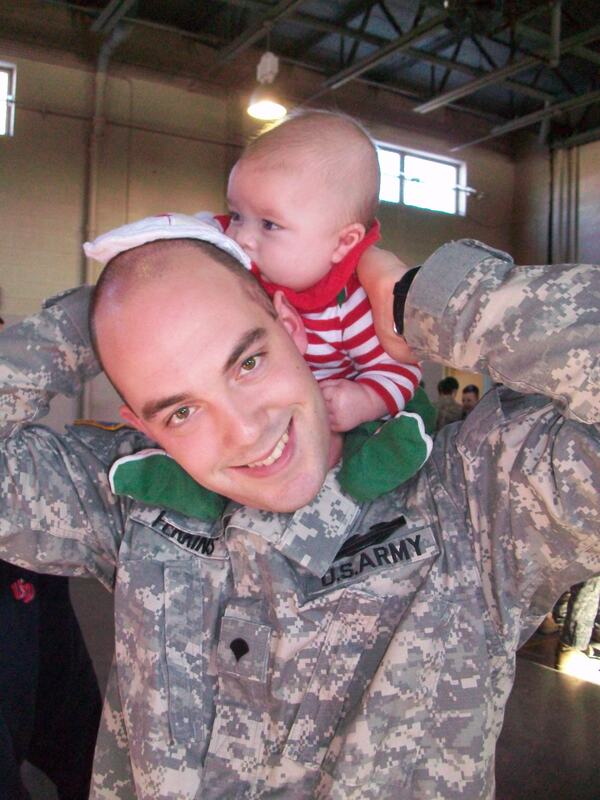 This past deployment was the hardest one to date since I deployed when my youngest son was just 3 months old. My wife had to take care of three children plus a newborn all by herself during my deployment. We just recently moved to Florida from California and the children are having a hard time making friends at their new schools and also getting adjusted. 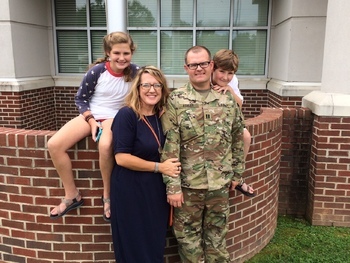 Since I have been back from deployment our family has not been able to spend quality time together due to our PCS among other things. It would mean everything to my family to be blessed with this and we would love to experience the magical moments Disney World has to offer. 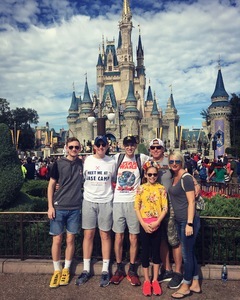 A trip to Disney World would be the ultimate blessing for our family as it allows us to spend quality time together and reconnect. Please consider this request as you would be making a true impact in our lives and we would be forever grateful. Thank you in advance and God bless. 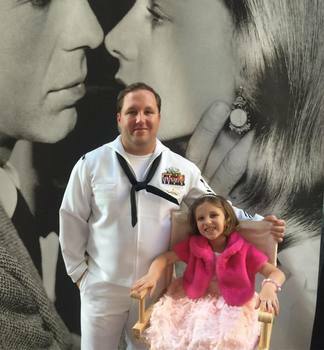 Donors, Thank you so much for the donations to make our family Hero's Wish come true. My family was so surprised at the tickets they were overcome with joy. My wife and children were so excited. The first day we went to animal kingdom followed by Epcot, Magic Kingdom, and Hollywood Studios. We had so much fun and trying to save some money to go back in the future. It gave me the opportunity to reconnect with my family after my deployment and pcs move. The quality time with my wife and children was priceless and I am so grateful for your kindness. Everyday we were exhausted because we walked so much that allowed us to do so many things. This time it was awesome being exhausted because it was so much fun. Thank you for caring about veterans and the troops and just know that your donation made such a wonderful impact on this family! 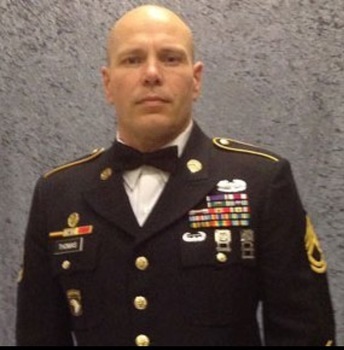 My name is SFC John C. Thomas. I was severely wounded in Iraq 2003 when a car bomb hit the police station where I served. 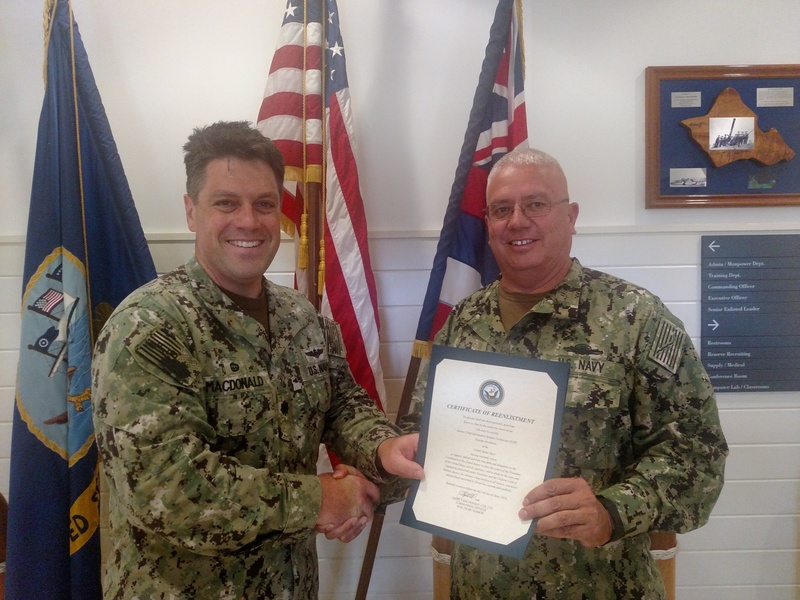 Thankfully, I was able to continue to serve for another 9 years until my retirement in 2014. I find it a privilege to have been able to serve my country for over 2 decades. 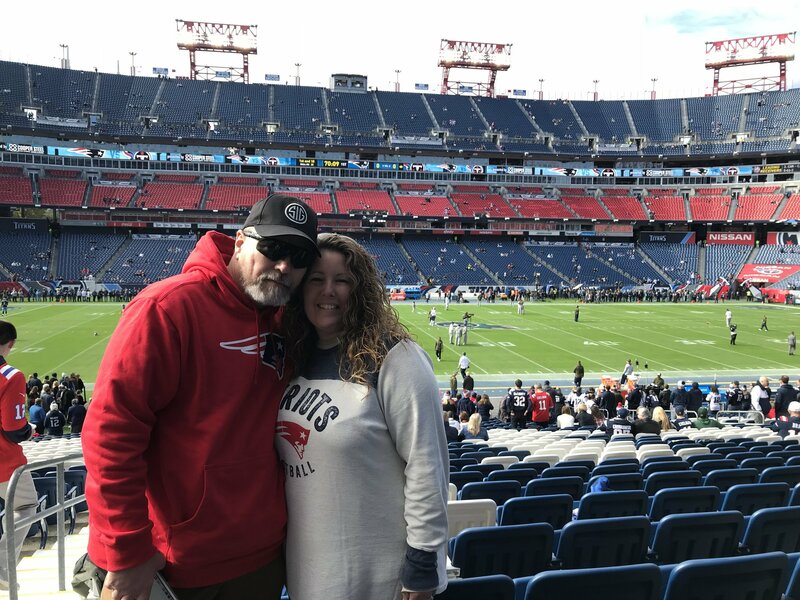 My hope is to watch the New England Patriots in our home state of Tennessee. The Patriots play the Tennessee Titans on Veterans’ Day 2018. I have been waiting for this opportunity to share with my wife for many years. We have 2 young daughters and do not get much time just to ourselves. This would be such a pleasure for the 2 of us. My name is Susan Jaenke, I am a Gold Star mother. My daughter HM2 Jaime S Jaenke, my daughter was KIA, 06/05/2006. Her Sea Bee group was sent out to clean up schools and hospitals. She was a Corpsman with MNCB25. She was killed in Anbar Providence on June 5th 2006. A series of Daisies went off under her HumVee killing her and the Driver. Jaime was the first female from Iowa to be killed in combat. She served both Navy and Marines. Since my daughters death we have had our vehicles repossessed and because there is no help for guardians I lost my house. Jaime had a daughter Kayla and I was gifted with raising her and if you know anything about children being raised by non parents but by Guardians you know that we lived on a shoe string. Kayla is now 21 and in college and working toward the medical field as was her Mom. She wants to work in Head traumas and brain injuries. She attends EIU. During the years after she passed, with the help of then Congressman Latham, we helped add muscle to the Sailors and Soldiers act, and changed the wording to the gratuity putting the control back into our warriors hands. The wording was changed and that change made the Warrior's wishes mandatory instead of the government wishes. My wish is to go to Disney World in Orlando, Fl. Thank you so much for for the Disney passes. Our first day at Disney was on Jaimes Birthday. Walking around Epcot seeing the sites and thinking of Jaime made it a perfect day. Warm, sunny, perfect. The following days the fun of Disney were relaxing. Thank you so much Vet Tix. Thank you so much donors for this wonderful week. Thank you thank you from this Gold Star Mom and this Navy Viet Nam Vet! 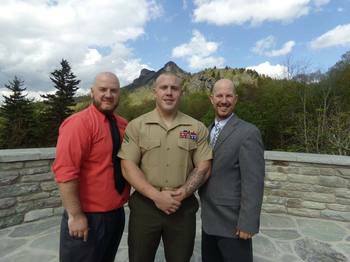 My name is Josh Gilbow I am active duty Marine Corps. I am currently deployed to Okinawa Japan. 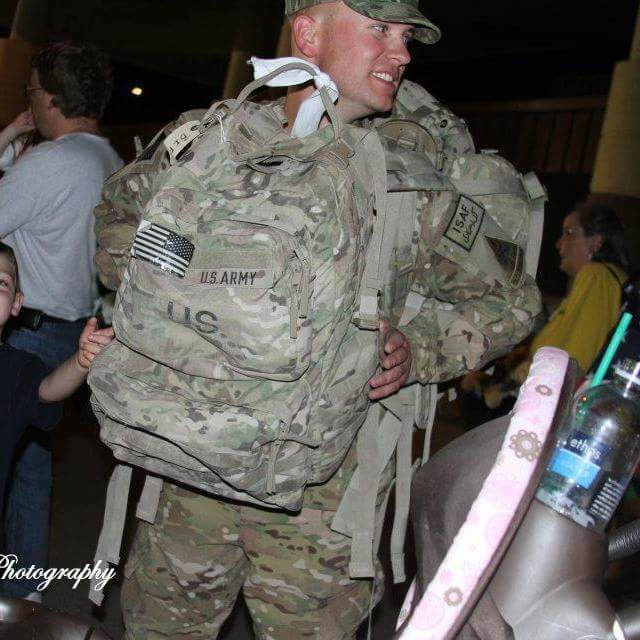 This is my daughters 3rd deployment were I have been away. I am currently scheduled to get back to Camp Pendleton in October a month early then scheduled and will be surprising her. 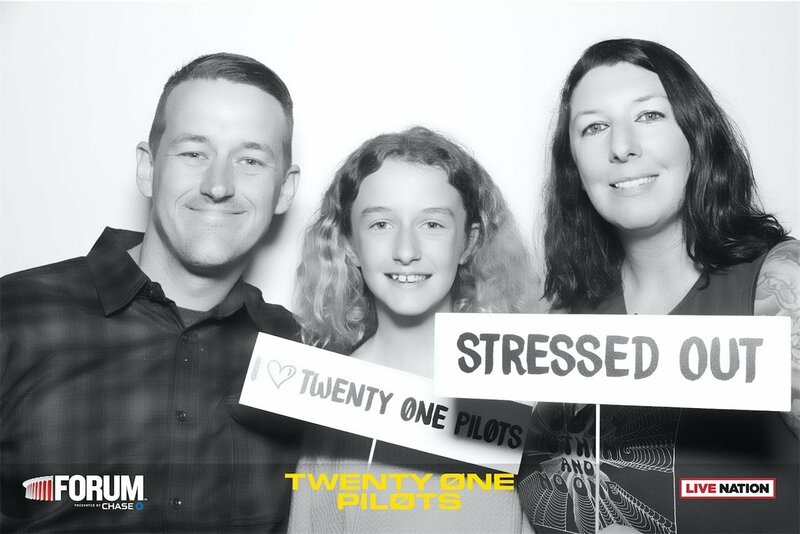 I would like to take my daughter and wife to see my daughters favorite band twenty one pilots on 10 November 2018 at the forum in Inglewood Ca. These tickets will allow me an opportunity to do share something she loves while being able to reconnect from my time away. She is a great kid and deserves this opportunity. My family and I would like to thank Vettix and all the donors for coming through in a big way! 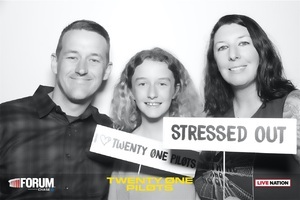 The tickets we received for the Twenty one Pilots show were unbelievable. We all had an incredible time. It was a great opportunity to share a great experience with my wife and daughter after being deployed. Thank you for making opportunities like this available. My name is Major Ryan White. I am currently deployed and part way through what will be a long 8 month separation. I am leaving behind my beautiful wife and two kids with a promise to make up the months of memories and moments when I return. My son is a huge Disney and Star Wars fan, and my daughter is just now warming up to the idea of a six foot tall Minnie Mouse. When I return I fully intend on taking my family on a much deserved vacation to California's Disneyland. 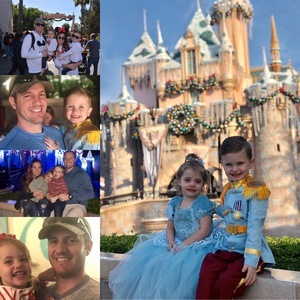 I am asking for 3 tickets to a 5 day Disneyland adventure where my family and I can relax, recovery, and recoup some missed moments together. Thank you for all of your support and God bless. I would like to say a big THANK YOU to Vet Tix and their donors for gifting my family and I five days at Disneyland. Because of your generosity, I was able to reconnect with my family after an 8 month deployment at the “happiest place on earth.” To see the smiles and enjoyment on my children’s faces as we spent time together riding rides and experiencing the magic of Disney will never be forgotten. Thank you! My name is Technical Sergeant Bradley Molnar. 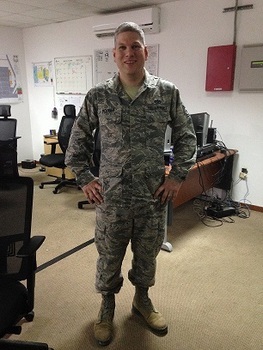 I have served in the Air Force for over 12 years and I will be returning from my 4th deployment this month. I would love to take my family to see the Michigan State Spartans play the Michigan Wolverines at Spartan stadium on October 20th 2018. I am a huge Michigan State Spartan fan and my wife loves the Michigan Wolverines. It is always fun for us on game day and it would be even more special to see them play from the stands instead of on TV. I am requesting 4 tickets to the Michigan State vs Michigan football game on October 20th, 2018. My name is MA2 Cory Rhea. My wish is to take my wife and daughters to Disney World when I return from my deployment by making my wish four park hopper passes. My wife is taking this deployment very hard and my girls are confused. 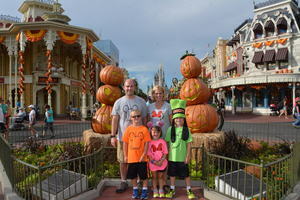 I would like to have some time with my family and Disney World is something every little girl dreams of. There are truly no words to express the gratitude that my family and I feel for each and every one of you that made our dream vacation come true. The last year away was extremely difficult on my daughters and wife. 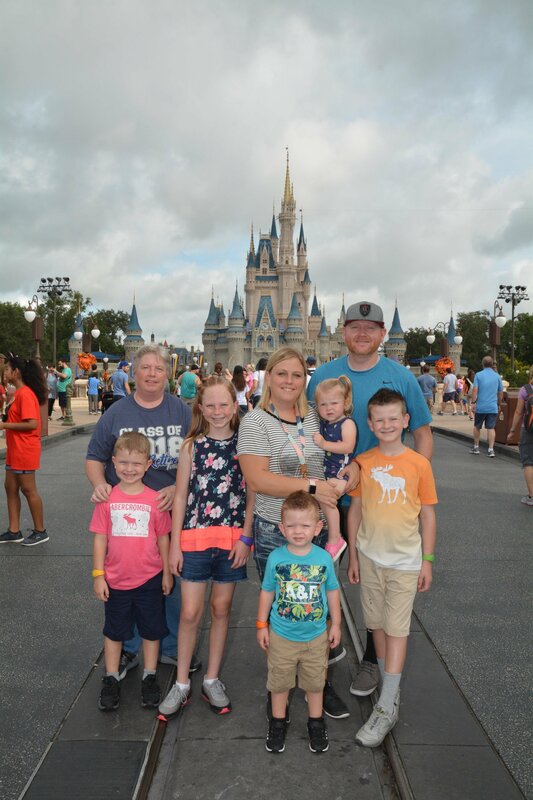 This trip to Disney World was a very magical way to reconnect. We truly reconnected in a very magical way. I feel closer than ever with my family and I truly feel it was your donations and prayers that made it all come true. We spent every moment possible embracing our vacation at all of the Disney parks. My girls have never been happier. Thank you all from the Rhea family and may God truly bless all of you. 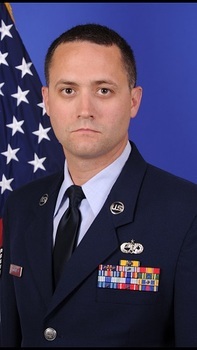 My name is MSgt Ryan Letourneau. I am currently deployed to Al Udeid AB since March 25. I’m coming home end of September and would be a nice surprise to take the wife and kids to see their favorite band! 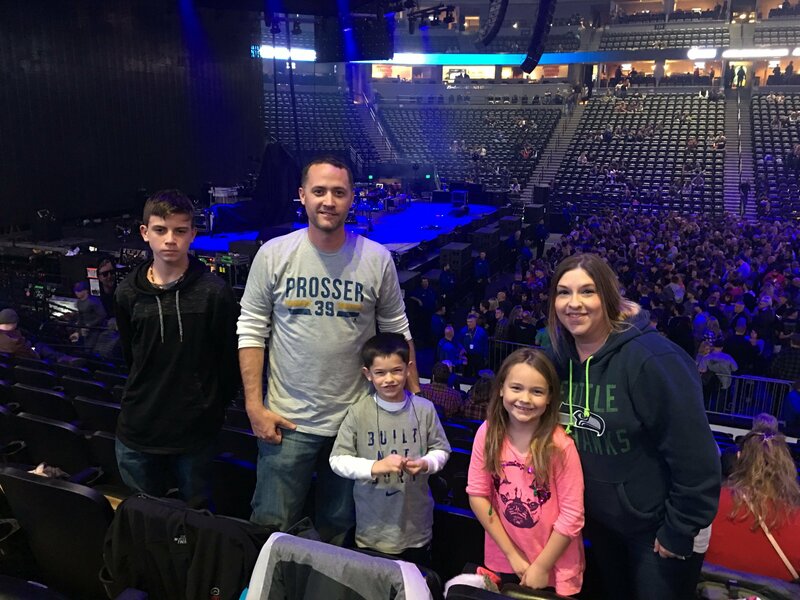 I wish to take my wife and 3 kids to the Foo Fighters Concert in Denver Colorado on October 10th. I would need 5 tickets. Thank you for your donation. It was my kids’ first concert and they had a great time! It was an unbelievable concert, and it’s something my family will never forget! I returned from a deployment roughly 3 weeks ago, and this was a great way to spend valuable time with my wife and kids! Thank you! My name is SPC. Quinn Jensen. 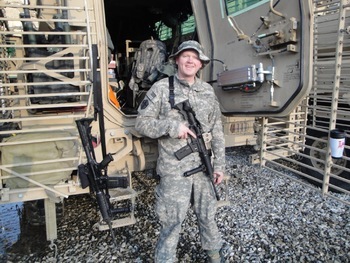 I became wounded after serving in Afghanistan and was hit by an IED explosion. This resulted in many injuries including a TBI, broken back, broken elbow and both of my heels being shattered. 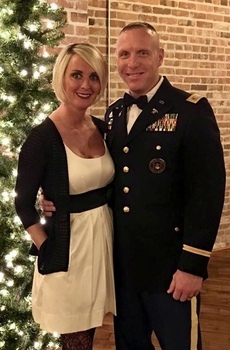 I spent three months as an inpatient at Brooke Army Medical Center in San Antonio where I received numerous surgeries and then continued to receive rehabilitation for several months following. Upon returning home to Utah, the pain in my right foot was too much to bare and was forced to have my right leg amputated. Although it has helped the pain significantly, I am very limited to the activities I can participate with my kids due to all my other injuries as well. 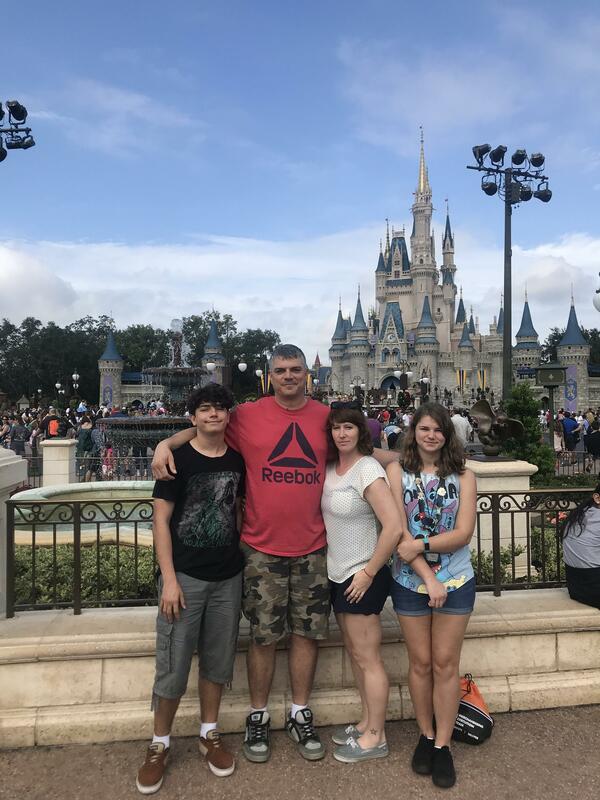 My wife, Monica, and I have been saving to take our kids to Disney World to give us quality time to spend as a family and create wonderful memories. We feel like it will create a better bond with myself and the kids as well as a family as a whole. We continue to save and will do everything we can to make it happen, but worry we will struggle to make it happen. We have five children; Kennedi (11), Brayden (8), Wyatt (5), Caleb (2), and Emeri (10 months). They have been so patient and understanding with my situation with not being to be involved in physical play, and I want them to know how much I appreciate their support. 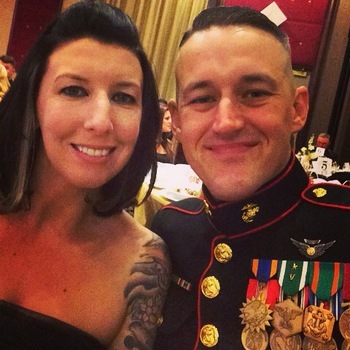 I also want to give my wife, who does the majority of the work around the house since I am unable to and cares for our kids most of the time, a small break or vacation from all the cooking and cleaning up she does on a daily basis!My wish is for Park Hopper Tickets to Disney World for me and my family..
My name is Cpl. Joshua McCart. While on my 2nd deployment with the 82nd Airborne (1/325) the truck I was in was hit by an IED( Feb.2007). This blast resulted in loss of hearing, multiple shrapnel wounds and the loss of my right hand. Like most people experiencing severe combat wounds I have been through many surgeries and even more mental and emotional struggles. I have been married for 12 years this year and have a 17 year old and 7 year old son. We would like to go to Universal Studios this October because it is a place that has something for every age. My 17 year old graduated this month and will start college soon. I would also like to take my mother in law who has been by our side every step of our journey. She has traveled when needed and watched the kids and dogs for every surgery or issue we have had during my recovery. Not to mention she has been an invaluable support for my wife so that my wife could in turn be supportive to me. 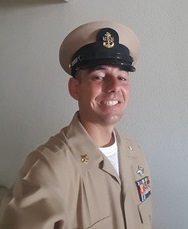 My name is MCPO George Arredondo and I am in the Navy Reserves and will be deploying to Afghanistan making this my 2nd tour plus the one in Iraq. 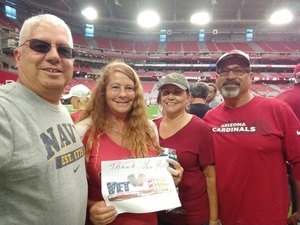 As I am soon to start my third journey to the Middle East I would like to take my wife and two family members with me to enjoy a home game with the Arizona Cardinals before I depart, as the NFL season begins. I look forward to the football season which is my favorite past-time. I enjoy spending time with family and friends in any opportunity I can to watch a good football game with them. This year will be different since I will be missing most of the season due to my military workup training requirements, travel to my area of operations, and the challenges that may bring. By the time I return a whole new football season will be in play. As I begin to focus on my upcoming mission I would like this opportunity to see a home game with my wife and family. I don’t know what the future holds but I’ll embrace what comes with it. Hello, my name is Bryan Silveri and I am currently deployed over seas where I have been since the beginning of September and I am due back sometime in April. This is my 6th deployment in 13 years and this has also been the most stressful and difficult one. It has been hard on me, but it has also taken a toll on my family. My 7yr old daughter Lucy and my 5yr old son Jackson are now old enough to understand that I am gone and it will be long time. It's especially hard on my son be he is Autistic and constantly fixates/obsesses over me being gone, if I am safe, or when I will be back home. So he has been extremely repetitive lately. Aside from that, this has really been difficult for my wife, because she is managing our son alone, along with my very delightful and helpful daughter. I would like to take them to Disney World in hopes of making up for all the birthdays, holidays, dr. appts, therapy appts, and events I have missed out on. I think everyone will enjoy it and it will give my wife hope again that everything will be fine. It will also help with my son obsessing over seeing Mickey! I miss home and I miss my family and I need this to help transition us as a family again, because after all, we are all human. Thanks for taking the time to read this. My name is Eric Perkins. 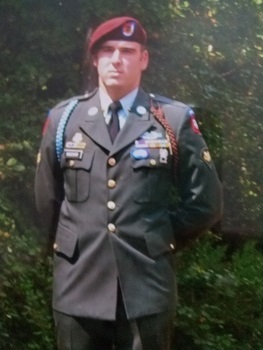 I was a Specialist in the NY Army National Guard 2-108th Infantry. I enlisted in July 2001. After September 11th, I was called to active duty for two years to assist with homeland security. 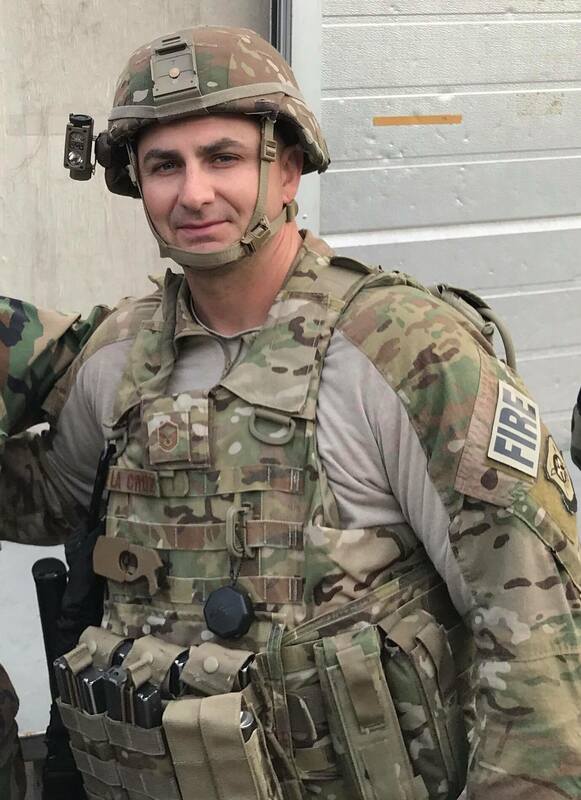 I then deployed to Afghanistan from 2007-2008 where I was a member of a six-man team that embedded with and trained the Afghan National Police. In July 2008 I suffered a head injury when a suicide bomber attacked my vehicle; for which I received a Purple Heart. I returned home to my wife and my 3 amazing children; Tyler 8, Owen 6, and Isabella 4. Isabella was diagnosed with Chiari Malformation when she was just a year old and subsequently had to have a neurosurgeon perform a decompression surgery. She has aspiration and reflux problems that require her not drink and receive her hydration by J-tube. Additionally she has sleep apnea which requires her to wear a bi-pap mask while sleeping. 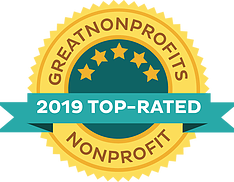 Providing the care she, and her brothers, need can be overwhelming at times but we have received the help of some amazing people along the way. All of the kids love Disney but Isabella absolutely loves Frozen. During one of her hospital stays (28 days) she insisted Frozen be played on a loop the entire time. I dream of seeing all of their delight in experiencing the Magic of Disney World. I simply cannot afford to make it happen on my own right now. I am thankful for the existence of this program for all those who it has already helped and I am now humbly wishful it can assist me in creating unforgettable memories for my entire family. I would like to request (5) 4-day Park Hopper Passes to Disney World. Thank you. Thank you. Thank you. 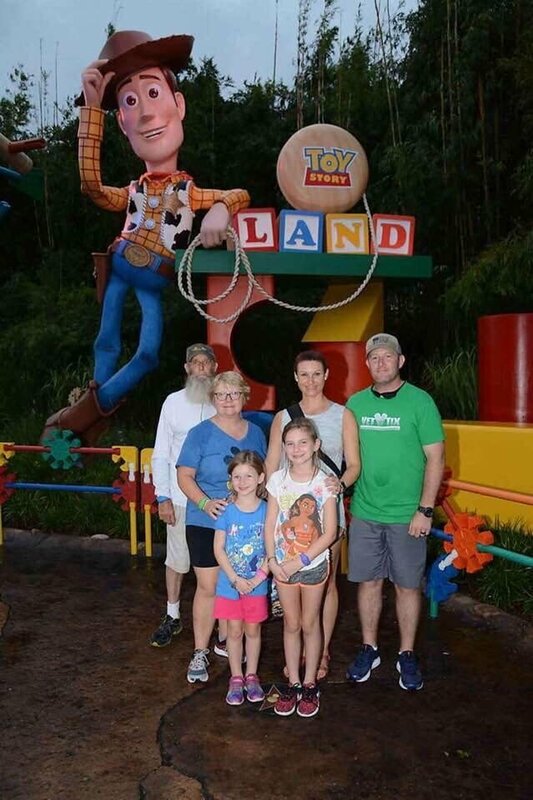 I cannot thank all of you enough for fulfilling my wish and allowing me to spend an incredible time with my family at Disney World. I had a great time and especially enjoyed seeing the delight and amazement in my children's faces. 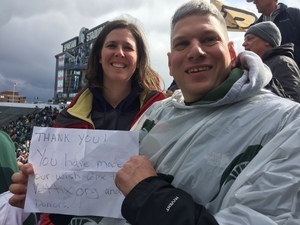 Thank you Sherry, David, Barry, Dale, Joseph, Karen, Mark, Rebecca, Vance, John, Miguel, Jose, Alesha, Wayne, Yvonne, Randal, Mark, Jeannie, Paula, Charles, Jerry, Kimberly, Norman, the anonymous donors and those who have contributed to the Hero's Wish General Fund. Also thank you to the VetTix staff who make this all possible. Hi! My name is Sgt Joshua Horne. 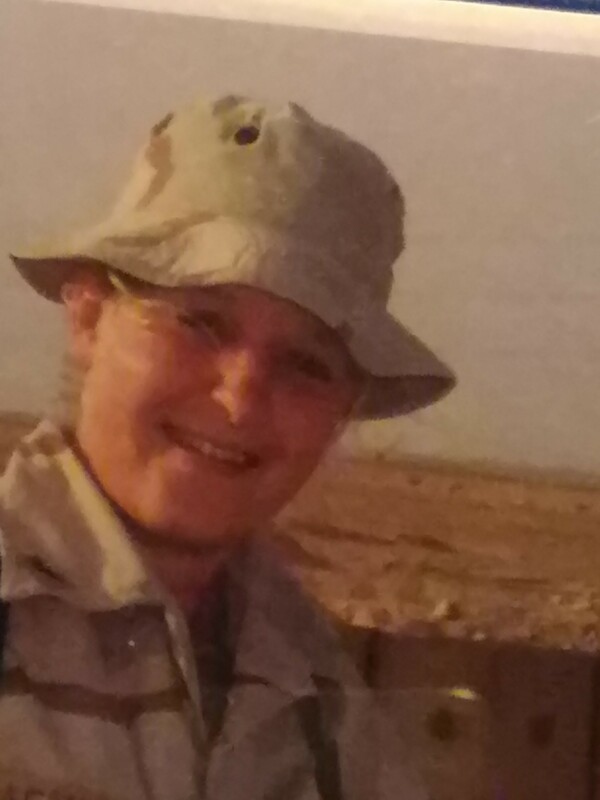 I lost my best friend in 2009, the day I was wounded. I later discovered infidelity within my first marriage which resulted in losing my family. Shortly thereafter, God led me to my current wife and, we were able to obtain sole custody of my kids which allowed us to be a blended family. We haven't had a honeymoon or anything and I'd really love to share in a family vacation. My world is complete, especially with the arrival of our now 18 month old daughter. We have 5 kids; 9,8,8,6 and 18 months. We have all girls and one boy. My wish is to be able to all go on a vacation and spend some much needed quality family time. I'd love to be able to take them to Legoland when I return around Sept 2017. My name is MSgt John de la Cruz and an active duty firefighter in the USAF. I have been in the military for 17 years and am currently on my 8th deployment and will be returning in August. I would like to take my family to Disney World when I get back. 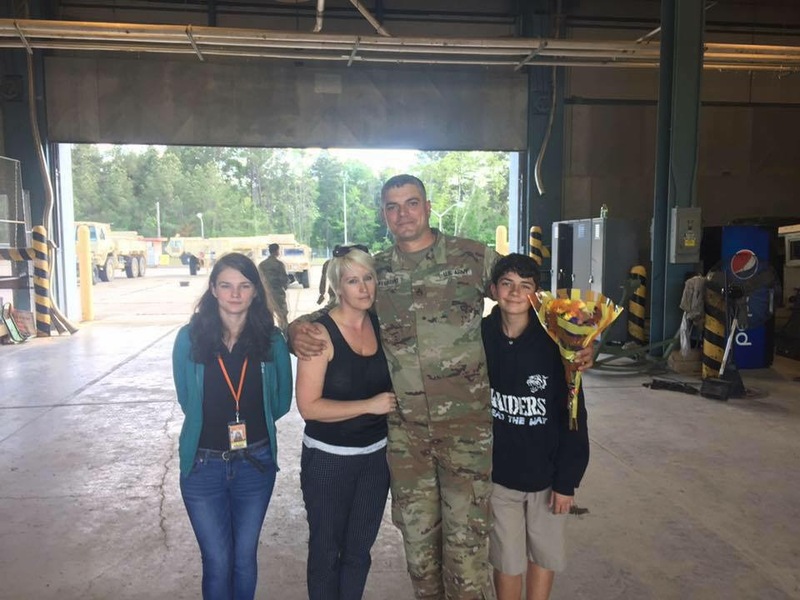 As my kids, 4 and 8, are a little older, this deployment has been particularly hard on them and I wanted to surprise them with a trip when I return. My wife is also currently finishing nursing school and will graduate in August and I hope to be back to celebrate her accomplishment and take her to Disney World. She was following me for my entire career and put her career on hold and has finally found the opportunity to follow her dreams. Our military spouses and kids are remarkable and I would love to be able to show them how much I appreciate everything they do for me.